I am an older guy. When I was a kid there were drugstores and candy stores that made some old time candies in house. 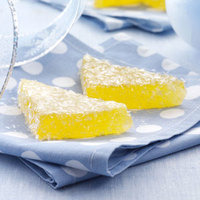 They were pretty much on the way out by the time I was a teenager, I am not that old :) Anyways, there is an old time southern candy made with gelatin similar to a gummy, it is a lemon gummy cube with vanilla in it. I haven't had them since I was a teenager. There was a juice line around for a short time called Redneck Juice Company. They had a juice called Lightning Bug, supposed to be like the lightning bug jelly candies, but with vanilla. Anyways, what is here is basically a remix of that juice with a lot less Sucralose and a more balanced lighter feel to get it to the older style treat. I had this one in EJMU and had not mixed it in over a year, I had the flavoring written down wrong and tried it again with TFA Gummy instead of TFA Swedish, which was a HUGE mistake. I feel Capella works better here than TFA Swedish or FLV Candy Roll. LA Lemonade, this is my go to Lemonade flavor, I really like crappy Country Time powdered lemonade mix :) It adds the candy lemon note without being too tart, as well as adding a good bit of sweetness. INW Shisha Vanilla, this is a really good vanilla to use when you need the three things it does very well. Crisp clean sweet vanilla with a slight cream note. CAP VC1, this low just adds a decent mouth-feel and thickens up the Shisha and Jelly Candy notes. CAP Super Sweet, this low is basically a drop per 10mL, it is noticeable and needed, you can sub sweetener of choice, but SS is magical when used just right. You can shake and vape, I truly feel it needs 5 to 7 days to fully come together. I like it a lot. My favorite thing about it is that instead of going for the more obvious TFA Marshmallow or TFA Vanilla Swirl, CAP Vanilla Custard was used to thicken it further than Jelly Candy can. It really makes for a satisfying vape. I will probably steal this use of 1% Vanilla Custard. I think I’d like it even more if it had a little more punch to the lemon - either a little more LA Lemonade and a little less Jelly Candy, or the addition of another, sharper Lemon, just a touch... or maybe if it used FLV Lemonade instead of LoraAnn’s. Regardless, this is a nice recipe and I’m very glad I mixed it up. Wow! This recipe is so well balanced. Candy profiles aren't my usual go-to but I haven't been able to put this down. The vanillas work great with the lemonade! They seem to soften the sharpness I usually get from LA Lemonade. This taste like a lemonade gummy ring, if that's even a thing. I strongly recommend mixing this. Fantastic job Fear!